Kelson is 67 years old and lives in the village of Kapazuka in Nkhata Bay district, northern Malawi. 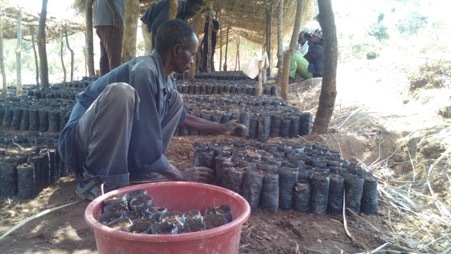 He is one of 500 participants in Temwa’s Nkhata Bay Natural Way (NBNW) project which, in association with the International Tree Foundation, helps to facilitate district-wide, sustainable natural resource training and to improve food security and livelihoods for the most disadvantaged households in the district. The NBNW has a particular focus on deforestation which has steadily developed into a key issue within the district. Alongside ongoing drought in Malawi, deforestation has impacted on Kelson’s community and its ability to grow crops. Without proper reforestation, land becomes exposed and the nutrient-rich topsoil can be eroded. In turn, this can lead to farmers moving on and clearing new areas of forest, perpetuating the cycle. Meanwhile, this is occurring against the backdrop of Malawi’s worsening food crisis. Kelson recognised the impact this was having on his family’s ability to grow food. He and his family are one of the most vulnerable in his community area. For over a year, the household has been without an adequate food supply due the irregular rainfall. This has affected the household income which, in turn, impacts on their access to healthcare and education. Even when much needed rains arrive, trees that used to protect soil from flooding were no longer present. Kelson’s involvement with Temwa’s NBNW project has enabled him to mould his community’s response to the food crisis, and deforestation, with Temwa’s support. The NBNW project has overseen a number of key achievements in communities like Kelson’s – since 2015, the initiative has helped its 500 participants, including Kelson, through sustainable farming training at 11 ‘demonstration gardens’ while also supporting the planting of 18,000 trees! The training has impacted positively on the income of households like Kelson’s as vegetable crops, such as soya beans, are now able to be grown and sold for a small income (soya also increases soil fertility!). In addition, Kelson sits on his local village committee, which manages and advocates for natural resource conservation in the area. This ensures that the initiatives are community-led and community-owned! You can help us to continue our work to support people like Kelson in coping with drought and climate change during the ongoing Malawian food crisis, by either donating, fundraising, or supporting our summer festival ticket crowdfunder!